Special to The Sun: The BHMS FBLA club members take a group photo with Super Coffee’s Mike Louden. 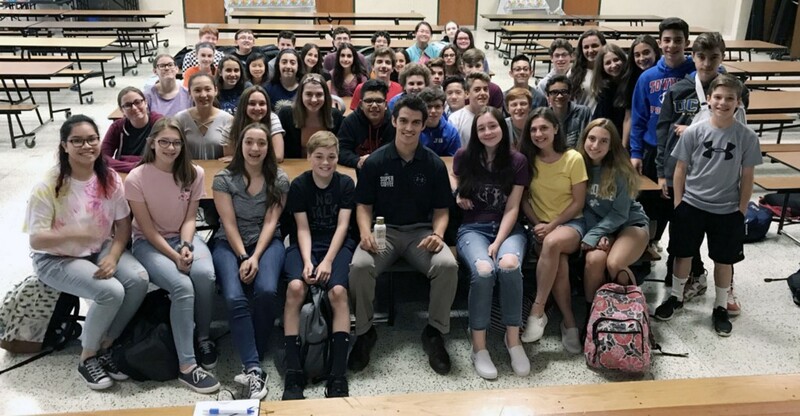 Washington Township High School students in Mrs. Sara Simpson’s Business Law class and Mrs. Roz Gill’s Entrepreneurship class welcomed two executives from the Super Coffee company on Tuesday, May 22. Founder Jordan DeCicco and Regional Director of Sales Mike Louden came to speak to the students about their business’ story and entrepreneurship in general, including their appearance on the hit show “Shark Tank.” Later in the day, Louden spoke to members of the Bunker Hill Middle School Future Business Leaders of America Club. 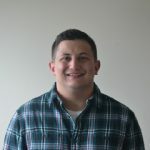 DeCicco started the company out of his dorm room at Philadelphia University, seeking a way to keep his energy, and his college basketball team’s energy, up without falling victim of a sugar-induced crash common with many flavored coffees and energy drinks. After months of experimenting, DeCicco found the right chemistry, and its popularity with teammates and other classmates convinced him he had something special on his hands. Special to The Sun: Mike Louden talks about the history of Super Coffee with the high school students. DeCicco took a leave of absence from school, moved into his brother’s apartment near Georgetown University in Washington, D.C., and officially started Super Coffee alongside brothers Jim and Jake. They brought on their first real “customer,” Jordan’s friend and Philadelphia University teammate Mike Louden, to help market the product, and within that year they were producing Super Coffee for Whole Foods and Acme. The team of athletes and founders brought their competitive nature to the business rooms, and they flourished. That led to an appearance on “Shark Tank,” where they did not receive an offer to their standard, but did receive invaluable exposure. In the month after the episode ran in February, the company’s sales matched the entire first year’s efforts. Louden and DeCicco answered questions from the students throughout the presentation. Their business continues to flourish, and local residents will soon, by Wednesday, May 23, be able to buy Super Coffee at the ShopRite in Glassboro. It’s also available in select Acmes, Wegman’s, Whole Foods and even Wawa. Super Coffee uses organic coffee beans and adds coconut oil and creamy proteins in its ingredients. The all-natural product is low in calories and high in good fats and proteins, and the founders tout that it provides all-day energy without the crash. They’re just happy to be able to provide the product to a growing customer base.